Golden eagles aren’t the only birds in Norway to land in the firing line in recent weeks. Protests are also flying over a proposal by Norwegian environmental authorities to allow hunting of the small songbirds known as måltrost and svarttrost (thrush), which have been hailed in traditional Norwegian songs themselves. goes the refrain of a classic children’s song about birds reappearing in the springtime in Norway. If state authorities get their way, many of the trost won’t. 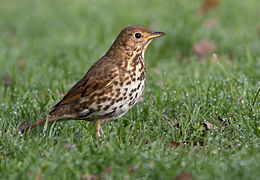 Among them is the brown spotted song thrush and the black-feathered version of the bird that, in Norway, often is referred to as the Norwegian equivalent of the Beatles’ “blackbird singing in the dead of night…” The trost have been singled out as being the targets of a hunt, because the state environmental authorities at Miljødirektoratet (Norwegian Environment Agency) claim their population is “strong and stable” and could tolerate hunting. The birds, they note, can pose a threat to Norwegian agriculture as well. Given the harsh and negative reaction that’s followed, he’s now singing another tune. “There’s been very strong opposition, and clear signals that this is perhaps something the public does not want,” Auran told NRK last week. He admitted that the proposal for songbird hunting has taken on unique proportions, because of the sharp response from the public. NRK reported that hundreds of people had signed NOF’s petition against the hunting proposal just in a matter of days, and Auran himself is acutely aware that written response in the first hearing round has been overwhelmingly negative. Even hunting organizations have emerged as opponents, for fear of how shooting the songbirds could damage their own reputation. “The response has been enormous, and shows that many see little reason to shoot more small birds in Norway,” Eggen of the ornithologists’ organization told NRK. He called the state authorities’ proposal, which will be evaluated this autumn, “incomprehensible” and poorly justified.